Dwayne Johnson doubts he’s in Fast & Furious 9 AND Hobbs and Shaw trailer drops tomorrow! The Fast and still Furious? New Hobbs and Shaw image has Dwayne Johnson, Jason Statham and Idris Elba looking badass! My god… the testosterone is dripping off this! 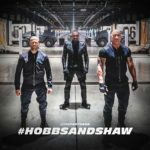 Hobbs & Shaw and Fast & Furious 9 news! Titles! Cast! Images! Woman, I am the calvary! Well, this is now a thing. Did not see this coming. Fast & Furious 9 gets delayed as Johnson and Statham spinoff steps up… with Shane Black sought to direct?! The Rock and Statham ARE being considered to star in a Fast & Furious spin-off movie! Was Vin Diesel threatened by the possibility of a Dwayne Johnson and Jason Statham Fast & Furious spin-off?! Did jealousy raise its ugly head? Fast & Furious writer wants to bring back Han and is open to taking the franchise into… space?! How far is TOO far for this franchise? Ongoing Dwayne Johnson/Vin Diesel spat over The Fate of The Furious? WATCH: Superbowl Spot for The Fate of the Furious is fast, furious and fun! Wait, what?! Could Paul Walker’s Brian O’Connor be set to return to the Fast & Furious movies?! It seems that even death doesn’t mean you can’t star in a new movie?